Here’s another little project I like to take on during the holiday rush. 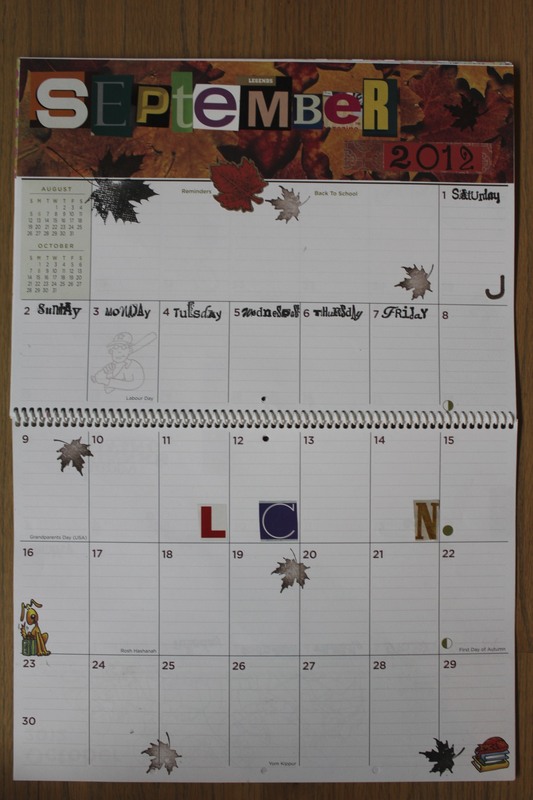 At least it seems like that is my intention, since I never get the calendars started in the fall when I have, oh, say, time on my hands. NO, that would be too easy. Let me explain. For the last 10 years (actually more but I’ve lost track) I have made what I refer to as “ransom note” calendars. 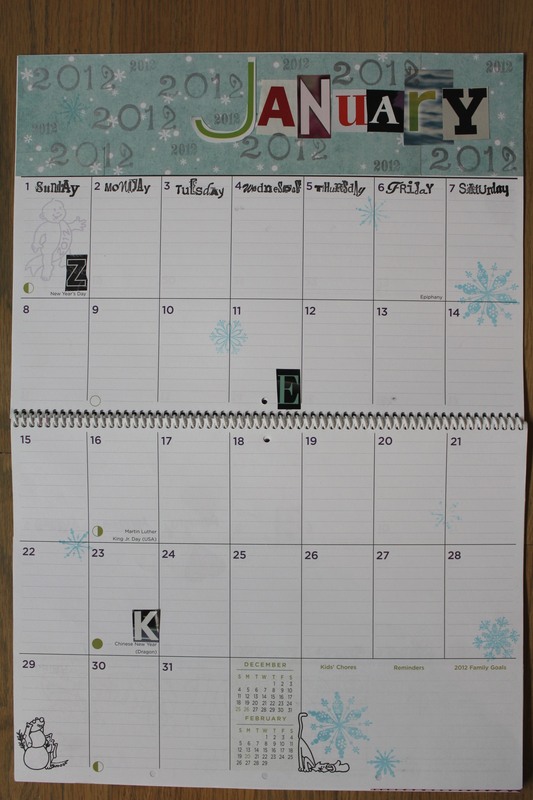 I take a large format calendar – such as the More Time Moms family planning one, and proceed to make it very personal. 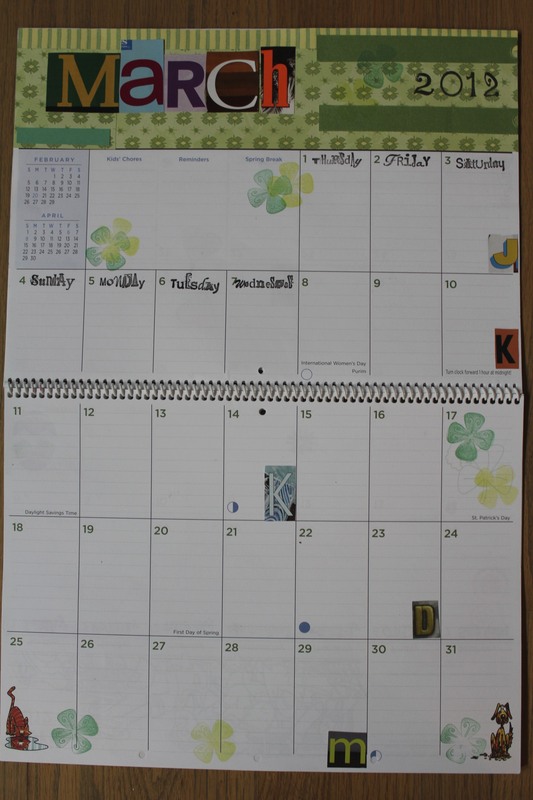 This started out as a practical way to personalize a calendar that had space to accommodate the busy schedules for a family of six. (At some point I tried to color code each person’s activities, but that idea died out fairly quickly.) 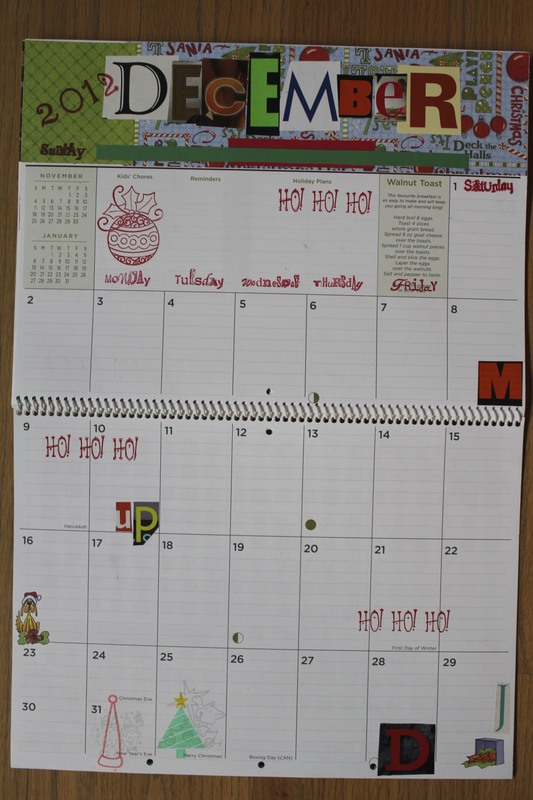 As my kids grew up and moved away we didn’t need such a large calendar, but I love doing the cut and paste thing. Let me walk you through the process. Colorful banners of paper are pieced and arranged to cover the artwork at the top of each page. Then I take paper letters cut from magazines, catalogues and a variety of sources, and I spell out the names of the months. For the year, I use cut out letters, rubber stamps or hand carved numbers. I also add cut out initials to mark birthdays for family members and good friends. I cut, paste, paint, stamp, staple and embellish any way that I am inspired to do so. Originally I used rubber cement and dry mounted all the bits together. (Dry mounting means you coat each side of the two papers you want to stick together, let the glue dry and then carefully join the items, being VERY careful so that nothing is misaligned.) This tedious old school technique creates a very permanent bond. One day it occurred to me that these calendars only need to last for one year! Now I use double-faced tape – much quicker and easier. Still tedious, but quicker and easier. 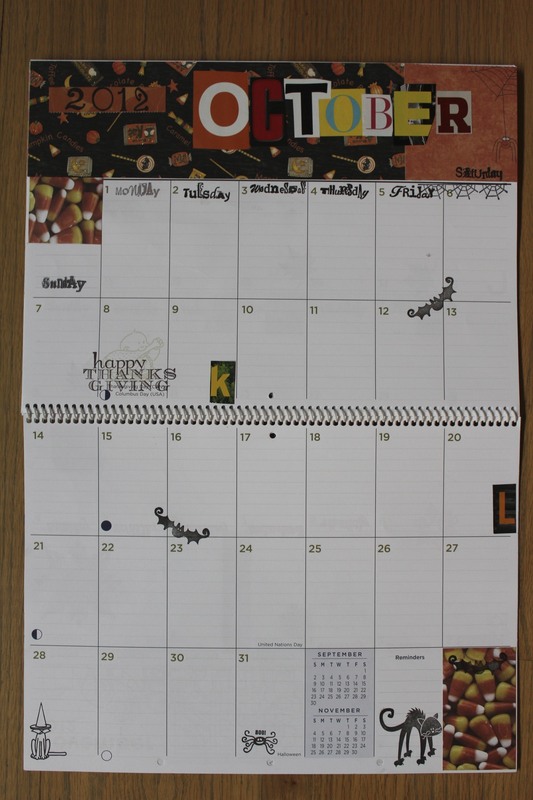 If you have read my blog, you may know that I am not able to make just one of anything, including a calendar. It did start out that way, but over time the number increased. Last year I got carried away. Last year I made 6 calendars. This year I decided I just didn’t have that kind of time. I made 2 calendars – one for my oldest daughter and one for a friend. I decided that I don’t need one. I use my computer calendar for appointments and scheduling, and those big empty white spaces on the wall calendar make it look like there is nothing going on in my life. So depressing! I did look into having calendars printed this year. 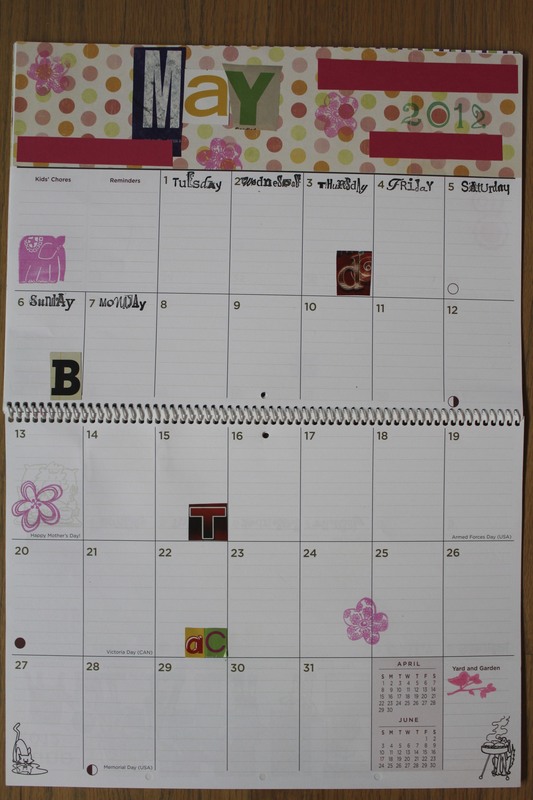 I thought that perhaps I could do one terrifically elaborate calendar and have great quality color copies make. Then I could add a little embellishment to personalize each one. Right. I need to do more research. The cost quotes obtained were exorbitant – plus I couldn’t find anyone who could do a long enough coil binding to hold the pages together. Add to that the ridiculous cost of shipping and this project was totally out of hand. Nothing is ever simple. I wish it were but it isn’t. Holiday theme months really give you something to work with. Other months are just filler. Here are some of the pages. If anyone does something similar, I’d love to see photos. Makes every month just great. I love this idea and especially love the fact that you take the time during the holidays to put these great gifts together for friends and family. Well done! Thank you. I must say I certainly feel good about them when they are finished!